With the title “National” in its name, there is an implication that the ONL will represent the country and its contributions to musical history. However, one thing that the French really never did was produce a wide body of works that are called symphonies. Of course, there are isolated exceptions, but overall, there are not that many big works in the tradition of Beethoven, Brahms, et al. Previous tours have usually included the Fantastique, lots of Ravel, Debussy, and a couple shorter works by contemporary composers. This time around, we stayed with the same formula, but with a couple of differences. Russian music was present with the 2nd Rachmaninov Concerto, played in Lyon by Lukas Geniušas and on the tour by Khatia Buniatishvili. One could not ask for two more different approaches to this staple of the repertoire. Lukas was introspective but not lacking in the technical skills needed for this piece. Khatia was extroverted with dynamics and tempi sometimes taken to extremes. Both concepts were valid, and each was received enthusiastically by its respective audiences. Also Russian in origin was Mussorgsky’s Pictures at an Exhibition. However, as I have done for the past five years or so, I used the Ravel orchestration but made adjustments to bring it more into line with the piano original. In a few places, I let the Frenchman get away with some of his changes, but others seem a bit indulgent. Not that I have the final word on this, as there have been more than 35 different orchestrations over the years. In any event, the orchestra played as if it were written for them. Four of the six German concerts contained this piece, and each time, it felt as if we were all looking at it afresh, with brilliant solos from trumpet, saxophone and tenor tuba. Ravel was also performed sort of on his own with Le Tombeau de Couperin. The original piano version contains six movements, and the composer orchestrated four of them. Turnabout is fair play, so we commissioned Thierry Pécou to write the remainder and bring the whole work to fruition for orchestra. Like Pictures, this has been done before, but we could not use any of the existing versions due to some very complicated French copyright laws. Perhaps you have read about the Ravel estate trying to keep its own rights to Bolero, as this piece is now in the public domain. Actually, the way the law is, we could have performed another orchestration of these two movements, as long as we did not play them in France! But to keep the publishing peace, we stuck to the agreement and performed the new versions. A lot of people, myself included, have done the Fugue, but the final Toccata has always been a problem. This is a very pianistic piece, and to perform it at the tempo indicated by Ravel is pretty much impossible for an orchestra. The Pécou version has a lot of good things going for it, but I needed to make some adjustments for the sake of clarity. As it turned out, we only played the six-movement work one time. All the others were in the standard four-part edition. Huge kudos to Clarisse, the first oboe, for astonishing musicality and technical wizardry in the demanding solos. With all the Ravel that we have been performing and recording over the years, Debussy has gotten lost in the shuffle. For this tour we brought La Mer as one of the concluding works. What a pleasure to do this with the ONL. Even though we worked very hard on the details, it was the innate “Frenchness” of the playing that impressed the most. Perhaps it is the delicacy of felicitous passages, or the use of native-made instruments for the winds, and maybe the years we have spent together, but everything fell into place during these performances. I can say that they were among the best of anything I have been involved with during my long career. This tour took place during the 100th anniversary of the armistice of World War l. Tombeau was appropriate, as it paid tribute to six friends of Ravel who were killed during the conflict. But I scheduled performances of Barber’s Adagio for Strings, just as a reminder of how music can convey the emotion that comes with loss, even though the original was simply the slow movement of a string quartet. It also served to show how glorious the ONL strings sound. Whether in the warmth of the Gewandhaus in Leipzig or the quirky acoustics of the Gasteig in Munich, each performance touched the hearts and souls of all those present. Encores were simple and to the point: the “Barcarolle” from Tales of Hoffmann and the “Can-Can.” For the latter, I usually did some schtick where I cajoled the audience into clapping in rhythmic unison and then chastised them for not stopping together. It was all in good fun, but in one venue, an audience member seemed to take exception to this and refused to clap along. I pointed at her and she stuck her tongue out at me. She finally gave in and had some fun in the end. I also invited one audience member to conduct while I took her seat in the audience. Tours have a way of bringing orchestra members together. This one was no exception. The good feelings all around went well beyond the concert halls. One could find the members of the ONL on the streets, interacting with each other as well as making new friends at random. Sadly, there was no time for a final party to celebrate the end of the trip. But at least I can look forward to January, when I next see them for the first Elgar symphony. About a week later, it was announced that Nikolaj Szeps-Znaider will become my successor as music director. The extremely talented violinist has been spending a great deal of time on the podium over the last ten years, and during his two visits to Lyon has impressed the orchestra and audience alike. He inherits a fine group of musicians eager to continue their musical growth. I wish Nikolaj the very best and hope to see him soon. Poland has become a regular stop on my concert itinerary. It started five years ago when I conducted two pieces in celebration of the 80th birthday of Krzysztof Penderecki. Cindy had studied with the master both in Krakow and at Yale, so there was a natural reason for me to be part of the festivities. I had also conducted several of his pieces, including the ones used in the soundtrack of the film The Exorcist. Most of my appearances have been with the Polish Radio orchestra based in Katowice, but this time it was for the final concert of the festival featuring the Warsaw Philharmonic. Since we had several days free prior to the commencement of my rehearsals, there was an opportunity to immerse myself in a wide-ranging variety of Penderecki’s works. All told, there were 12 concerts over the course of eight days, and I was able to attend ten of these, not including my own contribution. Pieces representing all his styles were performed, from early folk-inspired works, through the experiments of the late Sixties, and finally to the more conservative language that the composer has adopted more recently. Seminal to all this is the first violin concerto, where Penderecki abandoned the more aleatoric and effect-laden sonorities that dominated the time when his name was synonymous with the avant-garde. Much of this festival was devoted to his pieces for solo instruments with orchestra, as well as several of the symphonies. What impressed me most was the sheer variety of expression and individuality that encompasses his music over the years. 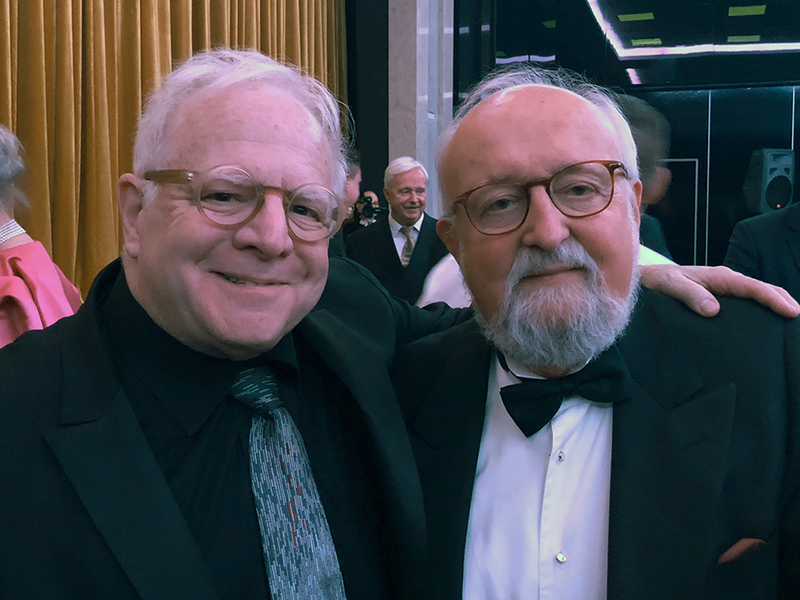 Whether in highly virtuosic works such as the Capriccio for Violin and Orchestra, or the devotion to large-scale religious works, as exemplified by the Credo, there is a wealth of treasure to be mined in Penderecki’s output. Of the works I did not know, the early sinfoniettas impressed me greatly, and I hope to include one of them in future programs. The festival is organized by his wife, Elzbieta, a powerhouse of energy and stamina. She virtually plans all of it, including the programing and hiring of the artists. There are also numerous social events, turning the affair into a music and food extravaganza. But it is also a time to schmooze with most of the artists who come to pay tribute. Hanging out with Anne-Sophie Mutter, Larry Foster, Christoph Eschenbach and so many others is simply fun. We trade stories and jokes, comment on the music and performances we have heard, and weigh in on how we perceive the music world today. My contribution musically was to conduct the very last work during the festival, a recent piece, the Dies Illa. It is relatively short by Penderecki standards, coming in at around 22 minutes. The scoring is for large chorus divided into three groups, three vocal soloists and orchestra. The novel touch is the use of instruments called tubaphones. These are huge pipes that extend from the back of the stage almost into the audience. They are pitched, and are hit with what look like ping-pong paddles. It is a strange sound, almost like low-tuned conga drums, but it makes a striking aural and visual impact. Cindy had a great time reconnecting with her mentor and many friends who came to honor the esteemed maestro. At the concert, he was awarded Poland’s highest honor as well as tributes from many distinguished representatives from all over the world. It was a great pleasure to be part of these festivities. More than likely, Elzbieta is already planning for the 90th birthday party. 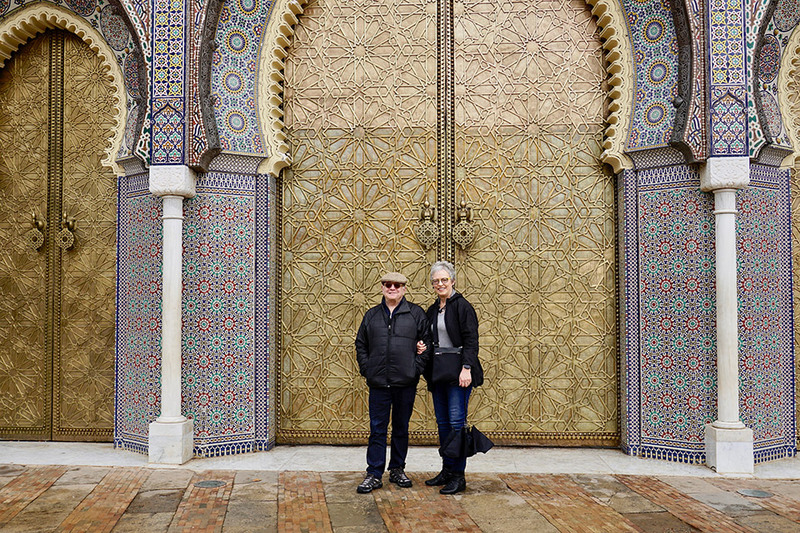 In keeping with my new policy of trying to take it a bit easier, Cindy and I took a week off between European gigs and headed to Morocco. It is a country I have long wanted to visit, and this was also Cindy’s very first trip to any part of Africa. 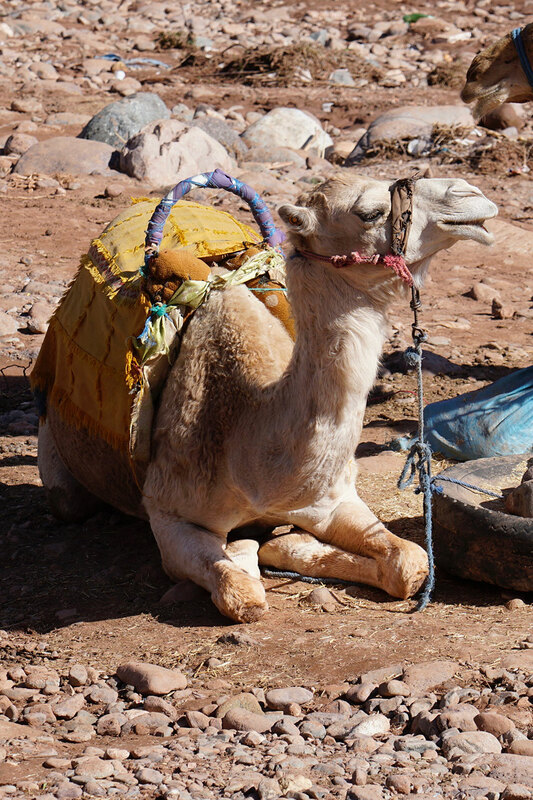 Visions of souks, Kasbahs and camels danced through my head. Would I be disappointed if much of the country turned out to be westernized, as so many parts of the world have become? If there is one place that everyone believes they know in this country, it is the backdrop for Humphrey Bogart, Ingrid Bergman and Co. All Cindy and I saw of the home to Rick’s Café was the airport. 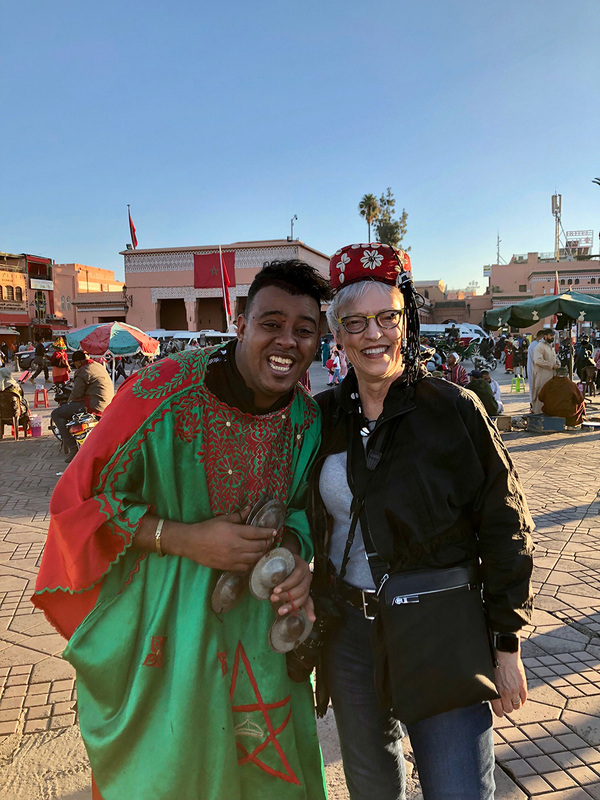 A two-hour flight to Paris and three more to Morocco were followed by a four-hour car ride to Fes. Yes, that spelling is correct. The one with the z is for the red hat. There were a lot of terms to come to terms with. Riad is basically a housing unit that contains a courtyard. These days it is commonly accepted that most hotels are riads. We stayed in one for the abbreviated first night. Then it was off for an Arabian orientation. Fes was the best place to start off. 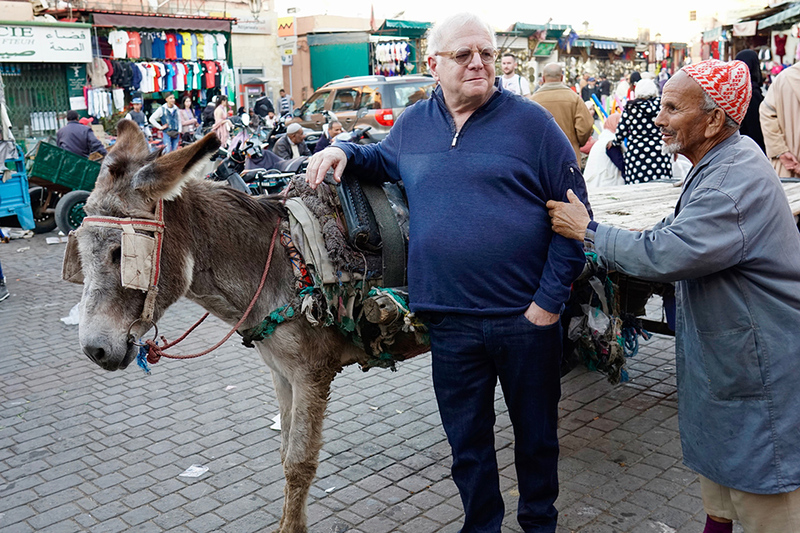 It is the second largest city in Morocco and apparently retains most things of the old order. The city is medieval, with streets and structures going back to the eighth century. The heart of this place, as it is with most larger towns, is the medina. 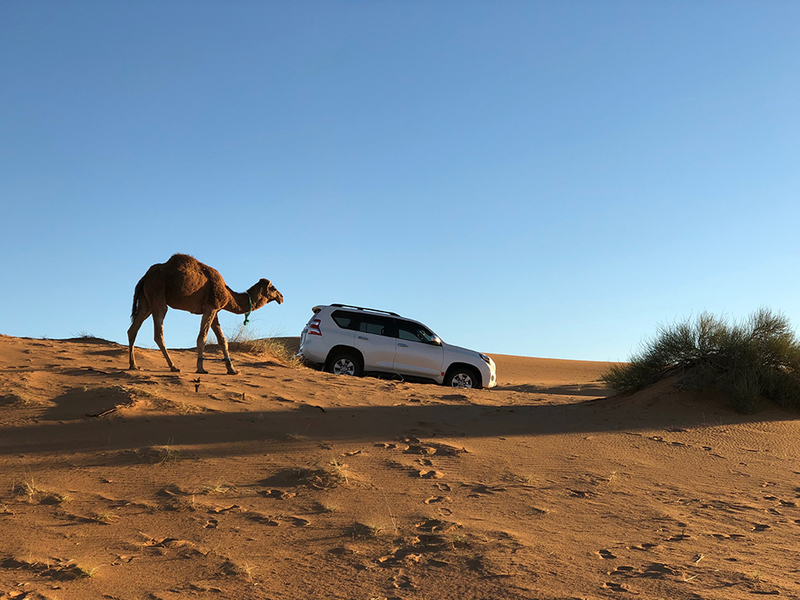 This is the Arabic center of North African … You know, this is starting to read like a very bad Bill Bryson book combined with the worst travel guide out there. Let’s go in a different direction. A Moroccan hammam—bathhouse—is quite different from its Turkish counterpart. In the latter, you get soaked, lathered up and sponged for an hour. The one I took in Marrakesh used various soaps, coarse loofahs and oils to accomplish the same thing. In either one, you are cleaner than the proverbial whistle, whatever that means. 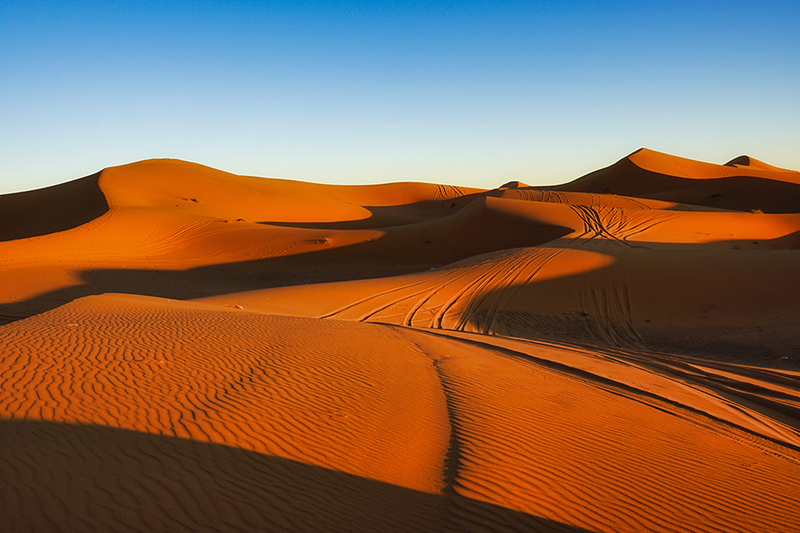 It is easier to get on a camel than it is to sit calmly as it rises off the sand. Cindy almost got thrown off, and Leonard of Arabia was not near enough to save her. You spend more money tipping people than you do for the entire trip. No matter what service is offered, you are expected to pay a little something. For example, locals will balk at having you take their picture, but the moment a few Dirham are offered, there is a total change of heart. But there is a big difference between these most congenial of people and the young street beggars, who should be avoided at any cost. More than likely, drivers ed starts with a lesson on how best to scare the daylights out of pedestrians. Actually, the cars sort of manage, but the prevalence of motor scooters and bicycles darting in and out of traffic makes for some very creative dance moves among those on foot. No problem talking politics here. Everyone has an opinion, but if you find yourself in a small village, the only issues are local. The food is delicious, with an emphasis on fresh vegetables and Mediterranean diet. But not so many fish, and no pork allowed due to the Muslim faith. As usual, all the breads are great, and everyone is happy to serve you tea. The snake charmers and cobras are a bit wimpy. Although the slithery critters have eyes, their daytime vision is blurry. In addition, they do not have outer ears and respond to the motion of the flute-like instrument rather than the sound itself. Happiness in Morocco is not defined by wealth. Simply keeping the community going and operating more as a cooperative is the way the small villages survive. They are content in knowing that their way of life continues uninterrupted. There are five basics that each town requires. Each must have a school, hospital, hammam, mosque and bakery. All other necessities are provided by the locals, including food and everyday goods and services. Many Moroccans never get to one of the bigger cities. What a wonderful country and people! In many respects, this microcosm of the Arabic world is a fine example of how a diverse set of people can come together and provide for each other. Yes, there are exclusive resorts, and between pashas, viziers, sultans and other potentates there can be some confusion. But the simplicity of life, utilizing only some of the technological advances of the 21st century, reminded me of a time when hard work was valued. There is so much to write about that perhaps one day I will pen something more along the line of my travels throughout the world. Seeing and learning about diverse cultures has been among the most rewarding aspects of my almost 75 years on the planet. I have been able to go to places that usually are only seen in books and movies. And with any luck, I will continue this journey of discovery for many more years to come. Near the end of November, one of the most brilliant magicians disappeared off the face of the earth. Ricky Jay died at age 72, much too soon for such a talent. Considered the ultimate master of sleight of hand, in addition to being an outstanding actor, Jay was a consummate showman. His shows were written and directed by no less than David Mamet, and to see him in a room of no more than 100 people was to witness magic at its best. I first encountered him at the fabled Magic Castle in Hollywood. My mother was dating another magician, and we all went to the club, where one could see the big names as well as the up-and-comers. Ricky was there, at the beginning of his career. He would stroll the bar area and do his thing for two or three people, eventually graduating as a headliner. It was from his presentations that I developed a true love of this very special art. I studied for about six months and put together a short routine with playing cards in which the four kings represented members of a string quartet. I had them disappearing and returning from their adventures in the orchestral world of the remaining 48 cards. At the end, the group disbanded and could no longer be found within the confines of the deck. An injury to one of my fingers ended my short but fun adventure into the world of legerdemain. But you had to see Ricky to truly understand the mastery of the art. There are numerous videos of him, and I suggest you try to find Ricky Jay and His 52 Assistants. It is there that you will understand that it was not just the sleight of hand that made him great, but the actual presentation and history he provided. Ricky could also throw a card so violently that it would stick into the skin of a watermelon. In poker it is possible to get four of a kind. Ricky Jay was one of a kind. We end this year with my annual gift of holiday songs arranged by my father. These were done in the early ’60s and are for double string orchestra with some additional instruments. This year I wanted to share the whole album with all of you, especially those who wrote so kindly following my bypass procedure. May the warmth of this music spread to each of you during the holiday season and beyond.